Goes well with the Charles Eames DSR Chair, Charles Eames DSW Chair and Eames DAR Chair.. The iconic Charles Eames DAW Chair in moulded fibreglass, plastic or fully upholstered is among the most iconic designs of the mid century. Expertly crafted from a single piece of fibreglass, plastic or cashmere, the Charles Eames DAW Chair features an organically shaped shell that follows the contours of the body. This offers optimal comfort, which is further enhanced by the addition of the armrests. 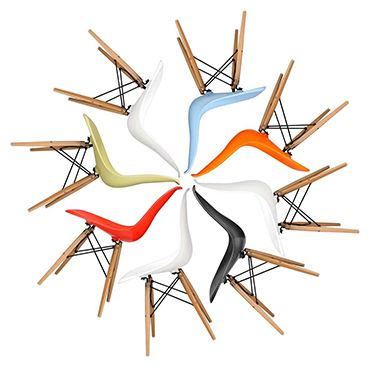 The Charles Eames DAW Chair is available in a variety of colours. It is created in the Eiffel Tower style, which is characteristic of many Charles Eames designs. This gives you the opportunity to find the perfect look for your home, or mix and match colours for maximum effect. The Charles Eames DAW Chair is one of a series of chairs designed by Charles Eames in 1948 for the Museum of Modern Art's Low-Cost Furniture Design competition. The original has the honour of being the first ever mass-produced plastic chair. The Charles Eames DAW Chair 's combination of comfort, durability and style has made it a popular choice for almost everywhere, from dining rooms to playrooms, offices to libraries. The name, DAW, is a reference to the attributes of the chair – Dining Chair with Armrests and Wooden legs. Recently, the Eames Chair DAW for Kids has been added to the STIN range. I have bought 6 Charles eames dining chairs, and the quality on their products never disapoint... But the Two orders i have made at stin.com have both been easy to pay, but there are always a problem that make the order come later than expected, and sometimes much later! But i will still recommend them because of the great quality and the payable prices.. I have never been worried about the fact of getting my orders.. But patience is necessary!